Pterosaurs: The Card Game uses images and information from the vast collections of the American Museum of Natural History in New York City, especially the 2014 special exhibition Pterosaurs: Flight in the Age of Dinosaurs. 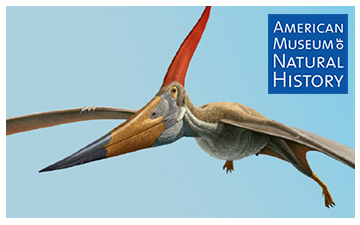 American Museum of Natural History Homepage. This deck has slightly modified rules due to the nature of information available on specific pterosaur species. Please see rules that accompany the printable cards pdf. Essentially, the deck has been classified as a BASIC deck. In short, this means that habitat (terrain, climate considerations) are similar throughout the deck so as to make connections more simpler to work out. As well, trophic values have been simplified to be represented only by number (and not colour). Pterosaurs were flying reptiles that lived during the age of dinosaurs— and the first vertebrates to fly under their own power. Pterosaurs: The Card Game uses images and information from the vast collections of the American Museum of Natural History in New York City, especially the 2014 special exhibition Pterosaurs: Flight in the Age of Dinosaurs. The game was co-designed with teenagers in the Museum’s #scienceFTW program and with game designer Nick Fortugno, based on an existing biodiversity card game, Phylo (Phylogame.org). Certain cards in Pterosaurs: The Card Game are special. When used in conjunction with the special mobile app, you can watch the animal come to life! The six special cards are listed below. Dimorphodon macronyx: Discovered near Lyme Regis, England, on what is now called the Jurassic Coast. Dimorphodon means “two-form tooth,” which refers to its two distinct types of teeth. Macronyx refers to its large claws. Jeholopterus ningchengensis: Named after a city near where it was found in Northeastern China. It lived in the forest, hunted insects, and is the only known species in its genus. Pteranodon longiceps: One of the most famous pterosaurs, having appeared in movies such as King Kong. Its name means “wing without tooth” and has been found in western Kansas. Scientists think it may have dived for fish. Pterodaustro guinazui: This pterosaur’s name comes from the Greek word “pteron” (wing) and the Latin word “auster” (south wind). It may have used its thousands of bristle-like teeth to strain crustaceans, plankton, and other small aquatic animals. Quetzalcoatlus northropi: Named after both the Aztec air god Quetzalcoatl and the Northrop Corporation, this Texan pterosaur had a wingspan of roughly 33 feet (the size of a 2-person airplane) and a height of 16-18 feet! Tupuxuara leonardii: Tupuxuara means “long crested” and has been found along ancient South American coasts. Scientists are not sure if they ate fruit or fish. The Pterosaur deck features illustrations by Raúl Martín, Ivy Rutsky, Constantin Astori, and others! American Museum of Natural History, Central Park West at 79th Street, New York, NY, 10024-5192 (google map). The American Museum of Natural History (abbreviated as AMNH), located on the Upper West Side of Manhattan in New York City, United States, is one of the largest and most celebrated museums in the world. Located in park-like grounds across the street from Central Park, the Museum comprises 25 interconnected buildings that house 46 permanent exhibition halls, research laboratories, and its renowned library. The collections contain over 32 million specimens, of which only a small fraction can be displayed at any given time (From Wikipedia, May 31, 2012).